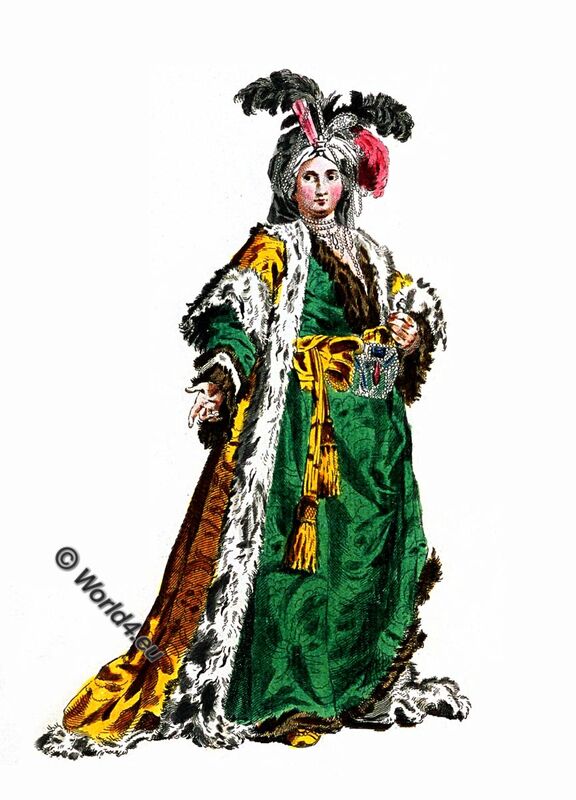 Home » Habit of the Sultaness Queen in 1749. THE SULTANESS QUEEN, from VIEN’S CARAVANE *. The Habit of the Women, like that of the Men, consists of a SADAY and KAFTAN; but the KAFTAN of the Women of the Seraglio is of wrought Silk, and is called the SHERWANEY KAFTAN, being in some Particulars different from the KAFTAN’ of all other Women. Source: A collection of the dresses of different nations, antient (i.e. ancient) and modern: paticularly old English dresses after the designs of Holbein, Vandyke, Hollar, and others: with an account of authorities, from which the figures are taken, and some short historical remarks on the subject: to which are added the habits of the principal characters on the English stage. Recueil des habillements de différentes nations, anciens et modernes, et en particulier des vieux ajustments anglois; d’après les dessins de Holbein, de Vandyke, de Hollar, et de quelques autres: avec une détail des sources & des autorités, d’où ces figures ont été prises; et quelques remarques historiques sur le sujet : auquel sont ajoutés les habits des principaux caracteres du théâtre anglois. By Thomas Jefferys, 1773.